USCIS held a stakeholder meeting today (03/03/2017) in Washington, DC on EB-5 matters. According to USCIS personnel, over 900 people registered to attend the stakeholder meeting, whether in-person or by telephone. • The May 30, 2013 USCIS Policy memorandum on EB-5, which explicitly stated that formal I-924 amendments are not required for a Regional Center to expand its geographic boundaries was represented by USCIS, to the surprise of many, as superseded by their new policy. This policy, effective December 23, 2016, states that any Regional Center wishing to sponsor a project outside of its geographic area must file a formal I-924 amendment application. Further, any I-526 petition filed by an investor based on such a project before USCIS approves the I-924 amendment will be denied on the grounds that it was not approvable when filed. Some audience members expressly objected, stating that (a) USCIS did not provide adequate notice of this very significant change in policy, and (b) that the adverse impact on Regional Centers, developers and EB-5 investors that have already filed I-526 petitions may be severe. 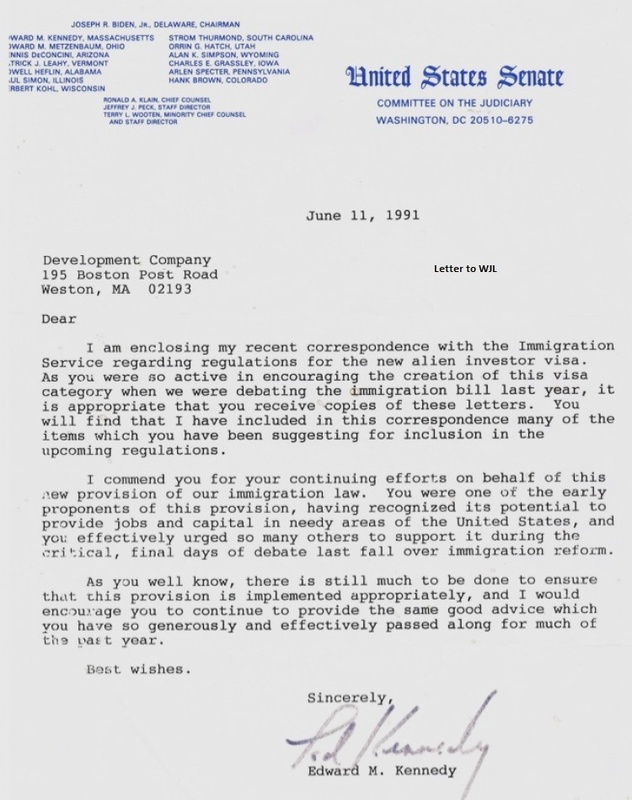 After reading Elliot Winer’s article, who is someone I've known for years, I thought I would share these docs (Edward Kennedy Letter, the first TEA Designation Letter) which we have kept since EB-5 was conceived as part of the Act in 1989-1990. About a week ago, I was asked by an EB-5 practitioner why I thought EB-5 TEA methods had slipped into using census-shared or, excuse the expression, "gerrymandered" Census Tract arrays? I told this fellow that Massachusetts and the INS (USCIS) had allowed this technique from before the Industry was accepted or recognized as a viable financial alternative by the investment community. It looks like we in Massachusetts elongated (again, “gerrymandered") the Census Tract array from the very beginning for very good reasons. We did this in Boston in 1991. Please notice the letter from Senator Ted Kennedy (who introduced the Act for consideration in 1989) showing the makeup of the 1991 Senate Judiciary Committee! It seems to show that Senators Grassley and Leahy, and other notables, were at least aware of the genesis of Senator Kennedy's legislative interest in the EB-5 Program. We were also there; we're old! The EB5 Securities Roundtable is an informal, independent group of EB-5 securities attorneys organized to facilitate best practices in the offerings of EB-5 securities.This roundtable has been working to provide comments to legislation (commonly known as the Integrity Bill) that we expect will be proposed by Congress to improve the integrity of the EB-5 program. Scott: In dealing with conflicts of interest, investment advisors have a fiduciary duty to do what's in the best interest of their clients. The broker-dealers in the EB5 space has a suitability obligation to assess their clients’ financial circumstances and investment objectives, and here in the EB5 space that would include a desire to get a Green Card, in assessing what specifically is an appropriate investment for a registered broker-dealer to recommend. Kurt: Robert, do you have a particular conflict of interest in EB5 that you think regional centers and attorneys should be careful of? Robert: One which did occur to me is the interests of a party which sells something into the job-creation enterprise (JCE), like a land-owner which may be related to the developer or the regional center owners or the manager of the NCE or all of the above. There's an important challenge to validate or confirm the value that is put on whatever it is that is being sold into the entity and to disclose who is getting paid for it. Kurt: Does that need to be disclosed in a prominent way to say, "this is what I'm valuing my property at and this is the equity contribution I'm making to this deal"? Is that how you disclose that conflict? Robert: Yes, and "this is how we came to that value which is tied to the land." Kurt: Some of the benefits of working with an EB5 business plan writer include their access to data subscriptions and their knowledge of USCIS memorandums and Requests for Evidence (RFEs) that have come out (quietly) over time. ‘Matter of Ho’ was a nice starting point for the industry, but it's evolved since then and one really does need to keep an eye on new precedent decisions. Phil: It's really important to stay abreast of all USCIS comments and memoranda. It really helps to make sure that your business plan gets through the adjudication process with as little resistance as possible. Marge: Data subscriptions are very helpful. For example, say for a 50,000 square foot hotel, we’re trying to determine whether or not the cost provided by the developer is within the realm of reason. If there are big variances between the figures provided and the data sets we’re referencing, we try and figure out where these are coming from, such as which cost segments are higher than this particular market calls for? Chris: An investment advisor is required to supervise all persons that are acting on its behalf. The SEC takes the position that they can sanction an advisor if they fail to reasonably supervise anyone who is acting on the advisor's behalf. Determining whether someone is a supervisor is, again, based on the factual circumstances. There are a few safe harbors but the best advice is to have some compliance procedures in place or elect a compliance officer in those instances. Some of additional requirements are that compensation structures need to be disclosed, conflicts of interests have to be more thoroughly disclosed than they necessarily would have to be if you weren't registered. The SEC is also going to look at you on an annual basis, and under a heightened level of scrutiny because you will be filing Form ADV. Kurt: How do you see the role of the broker dealer evolviing as regional centers are required to provide certifications of securities compliance as stipulated in the draft Integrity Bill? Greg: I'm not yet ready to concede that regional centers have to be broker dealers but it's all based on what activities they're engaged in. You certainly can't use a broker dealer as a shield, if either the issuer or the regional center is going to engage in unlicensed broker dealer activity, but I think we're going to see more broker-dealers in the space. Ronnie: Right now, a substantial majority, and I'm guessing over 90% of EB5 capital, is not raised through broker dealers. I could be wrong but that's my perception. That's not good or bad, it's just the reality. I don't think we're trying to change the industry but we want to strengthen compliance with certain procedures, in particular the ‘33 Act (Securities Act of 1933) with disclosures. I think everybody agrees that we need to make sure there's proper disclosures. Whoever the issuer is, and the principal to the issuer, needs to take responsibility for complying with many of the items in the proposed Integrity Bill. Now the question becomes, do we impose that responsibility on regional centers, if they are not the issuer? How Do EB-5 Issuers Register as Investment Advisors? Kurt: Form ADV is the form that, to a large extent, represents what registration as an investment advisor looks like. Is that right Lori? Lori: Form ADV is your general form that the SEC uses and which the individual states use to register an investment advisor. You would also use Form ADV to provide notifications to the SEC of an exemption. If you are an investment advisor, or if you're someone that might be deemed an investment advisor but you believe you may be subject to an exemption from registration, you can use Form ADV to document that exemption and notify the SEC. This is an important point because even if you do fall under the $150 million private fund exemption, you must still fill out that particular portion of the Form ADV. Of course, if exempt, you don't have the extra requirements that we talked about earlier. The instructions to Form ADV are really quite helpful in that it provides a great deal of easily understandable terms and definitions that will expand upon the topics we're discussing. Should EB-5 Issuers Register as RIAs with States or the SEC? Kurt: Let’s discuss federal and state registration as an investment advisor (RIA). An unusual aspect of registration is that you need to determine whether you should be registering with a single state, multiple states or with the SEC (federally). In some cases, you can register with the SEC, which means you’re exempt from the requirement to register with the states, while in others, you're not allowed to register with the SEC but must register with one or more state agencies. These choices often depend on the amount of funds under management or upon each state's specific regulations. Also, where your principal office is located and the states you're doing business in determine which states you need to register in. To complicate matters further, registration may be required where the fund investors are domiciled. But even that is not clear. There's an argument, "Hey, wait a minute. The investors are coming from China. They're not in any state when they make the investment."